This is my third Eye Makeup Picture Tutorial and I am really happy :) If you haven't checked the earlier two already below are the links. Apply an eye shadow primer all over the lid till the brow bone. Apply a dark teal e/s till the crease with the help of a flat stiff brush and blend at the crease with a clean blending brush. 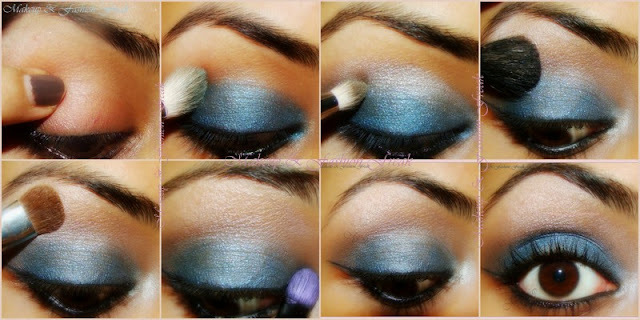 Apply a silver e/s on the crease with the help of a pencil brush. Lightly blend with a tapered blending brush. Highlight the brow bone with a pale yellow-white e/s. With the same e/s as above do the inner corner. Apply a thin(or thick as you prefer) liquid eyeliner on your upper lash line. Also line your lower lash line and waterline. Hope you enjoyed the tutorial. Do let me know if you have any questions by commenting below.